Discussion in 'Android Tablet News' started by xaueious, Feb 15, 2011. Korean company Hardkernel, has announced their developer tablet for a end-of-March release, the ODROID-A. The following video demonstration shows a Quadrant benchmark score over 2000, which doesn't really mean that much. 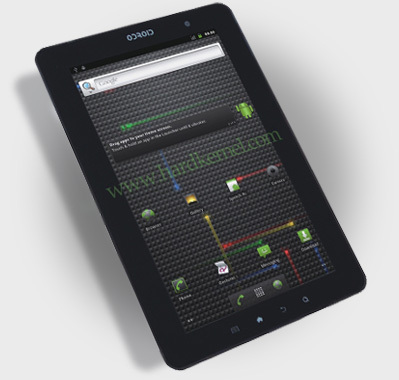 The developer tablet is one of the first tablets to ship with Samsung's new Orion Exynos4210 and also a Mali-400 GPU Core. The Orion is expected to be a dual-core Cortex A9 processor at 1GHz. The price is listed at $749.00. This gives us a point-of-reference for other future Orion based products. The ODROID-A will have 1GB of RAM, a 10.1" 1366x768 capacitive multitouch display, Android 2.3 Gingerbread, dual cameras (3MP back, 1.3MP front), HSPA+ support, wifi-n (FM radio disabled), bluetooth, 8GB internal flash memory, GPS, HDMI, and a load of sensors (linear motor, geo-magnetic sensor, g-sensor and gyroscope). The question everyone is asking: will this be upgradable to Honeycomb?